Imagine! 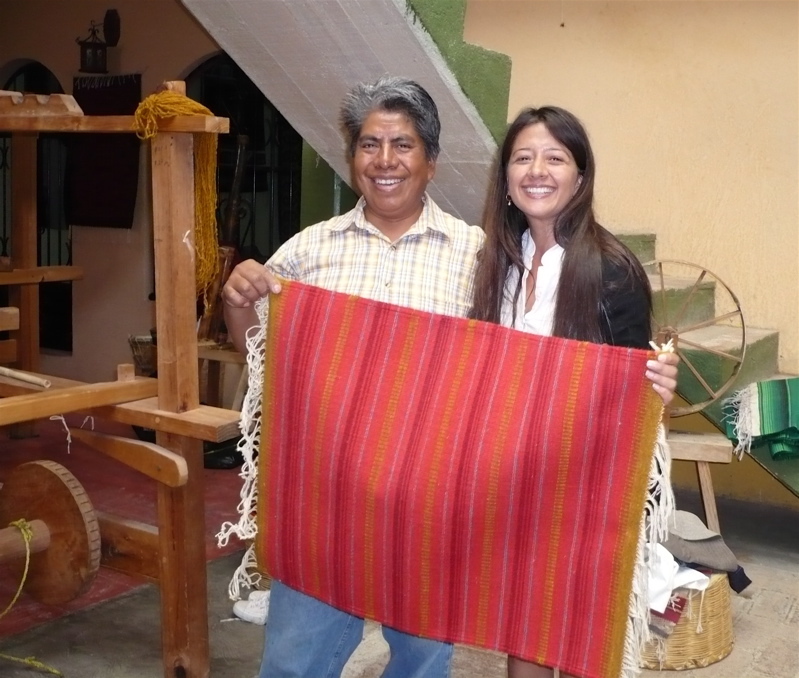 A hands-on weaving workshop in Teotitlan del Valle, Oaxaca, Mexico, with master weaver Federico Chavez Sosa. Federico’s daughter Janet, who co-teaches the workshops, is fluent in English and a university student of languages and linguistics. All instruction is translated for easy understanding. 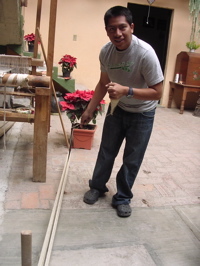 The Chavez family’s oldest son, Eric Chavez Santiago, is director of education at the new Museo Textil de Oaxaca (textile museum). Photos on this page are from recent workshop. 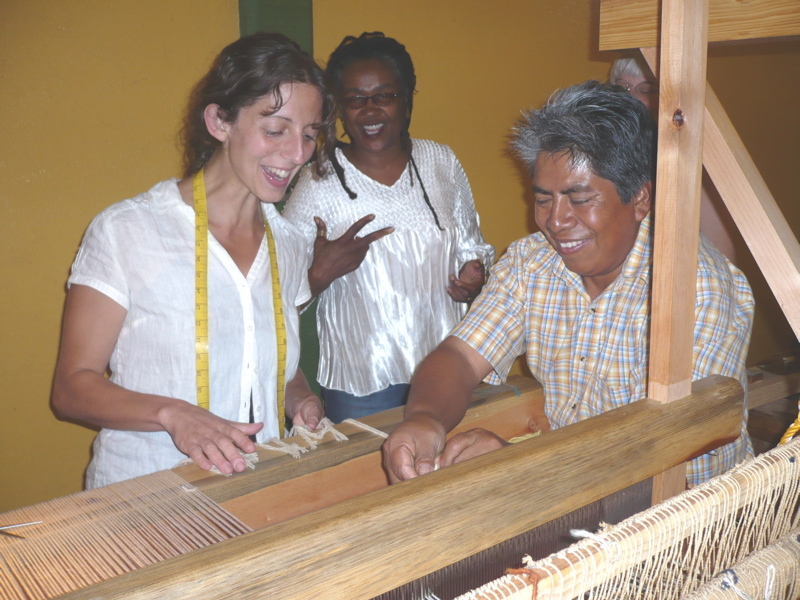 Most participants had never been at a loom before! 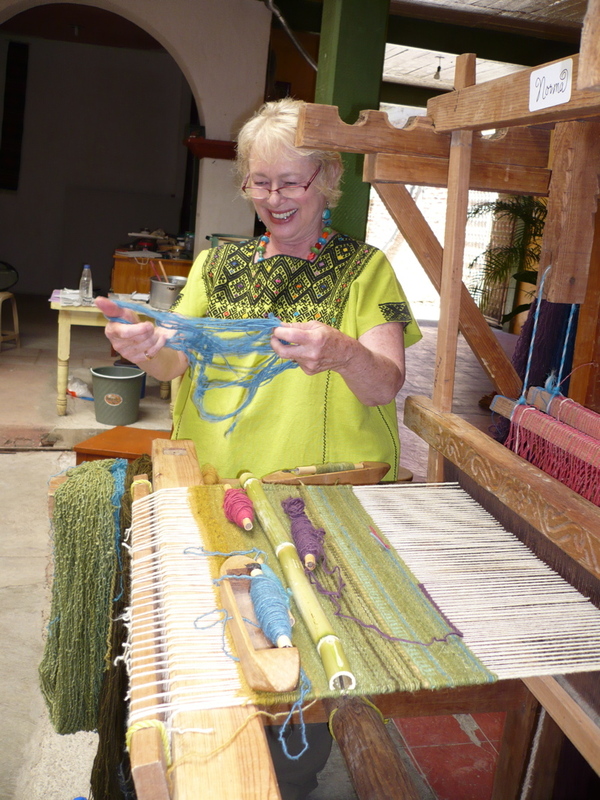 We welcome both experienced students and beginners for an extraordinary week living in a Zapotec village and weaving on a tapestry loom. Upcoming Dates — Accepting Registrations Now: Beginners Welcome! Workshop tuition is $965 per person, including lodging (double occupancy) and many meals. Workshop is limited to 5 participants. 4 days of instruction, Monday-Thursday. 6 nights lodging, Saturday-Thursday. Arrive Saturday and depart Friday. Bring a friend and you will both receive a 15% discount. 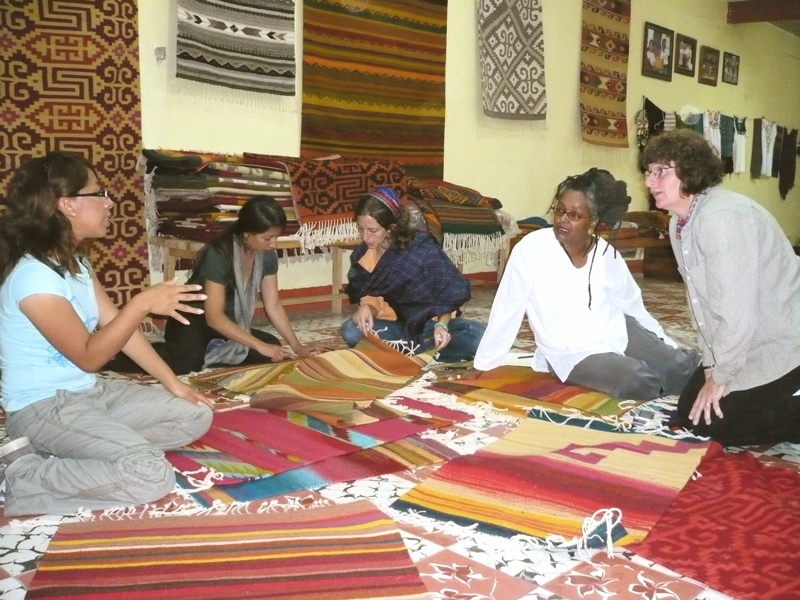 Includes 22+ hours of personalized instruction, 5 participants maximum enrollment, for weavers, knitters, natural dye aficionados, artists, teachers, university students, parents and children (over age 10 when accompanied by an adult). Cost includes 6 nights lodging, 6 breakfasts, 4 lunches, supplementary notebook of information and resources, plus lots of extras. 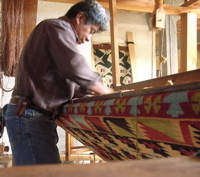 Workshops are limited to 5 participants, with personalized instruction from master weavers Federico Chavez Sosa and his family. You are invited into the Chavez family home and studio workshop. 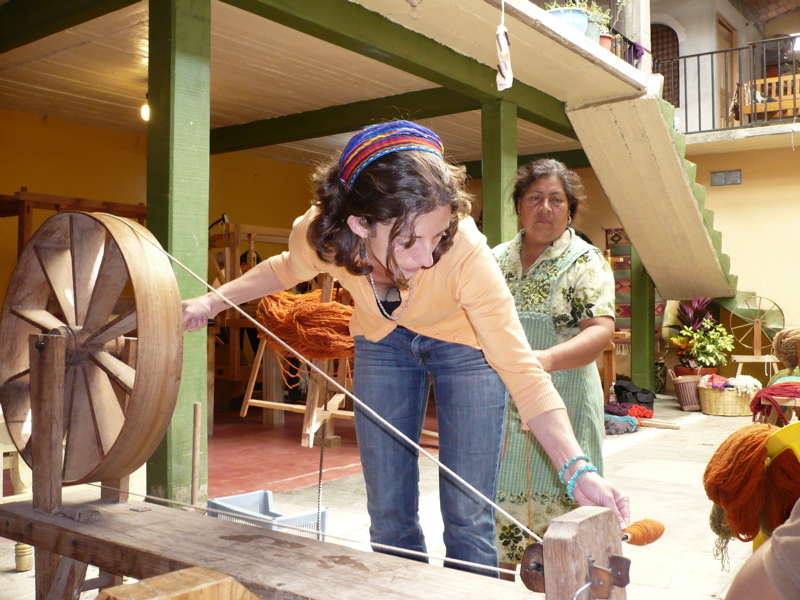 Not only will you learn the way Zapotecs have been weaving for over 500 years, and dyeing for millenia, you will be experiencing village life through a very unique and personal perspective. The Chavez family have traveled and exhibited throughout the United States, are in the permanent collections of galleries, museums and artists, including the Snite Museum of Art at the University of Notre Dame. They have exhibited and lectured widely, including at the National Museum of Mexican Art (Chicago), the San Jose (CA) Quilt and Textile Museum, the American Tapestry Alliance, University of North Carolina at Chapel Hill, Purdue University, and the University of California at Santa Cruz. Level of Experience Necessary: These are small group, hands-on workshops that can accommodate varying levels of expertise, from beginner to advanced student. 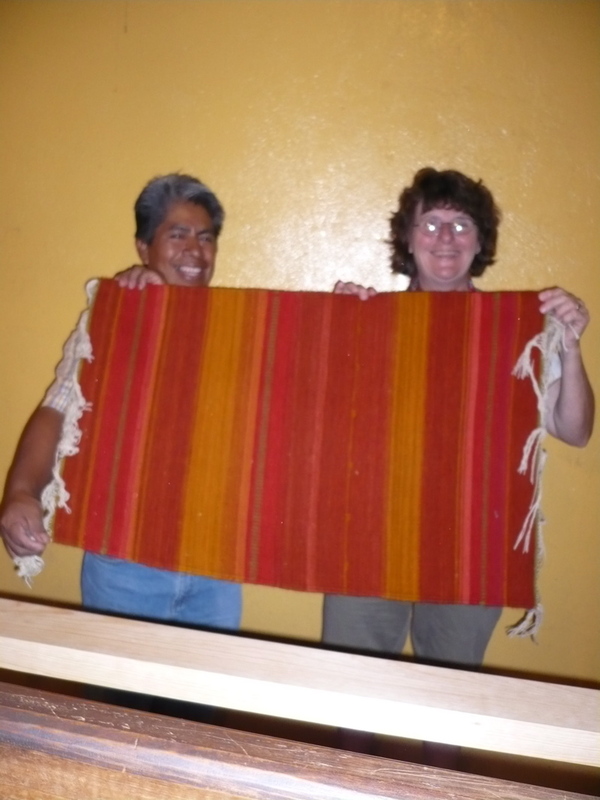 Because the size of each group is limited to 5 people, you will receive individualized instruction and coaching from the master weaving family of Federico Chavez Sosa. 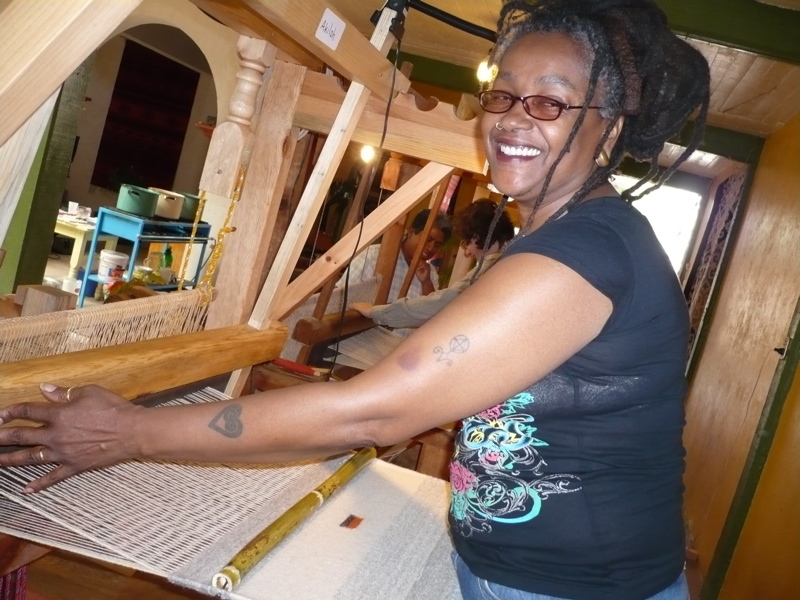 More experienced weavers can create more complex projects. Each student will be assigned her or his own loom for the session. The loom will be dressed (warped) and ready for you to begin weaving upon arrival. 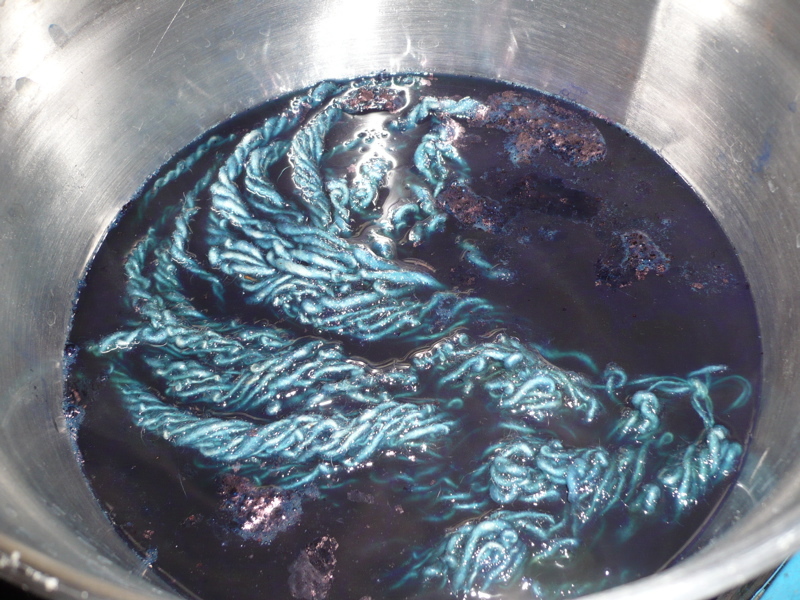 Materials include your choice of naturally dyed wool yarn from which you will weave a sampler textile that can be used as a wall hanging, pillow cover, or comprise the body of a purse or shoulder bag. 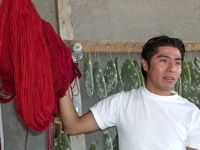 You will select the wool from colors dyed with pomegranates, pecans, mosses, indigo, and cochineal. Our participants have created amazing textiles that range from 18 inches to 30 inches in length. Work under the expert guidance of weavers whose family has been creating extraordinary textiles for generations. 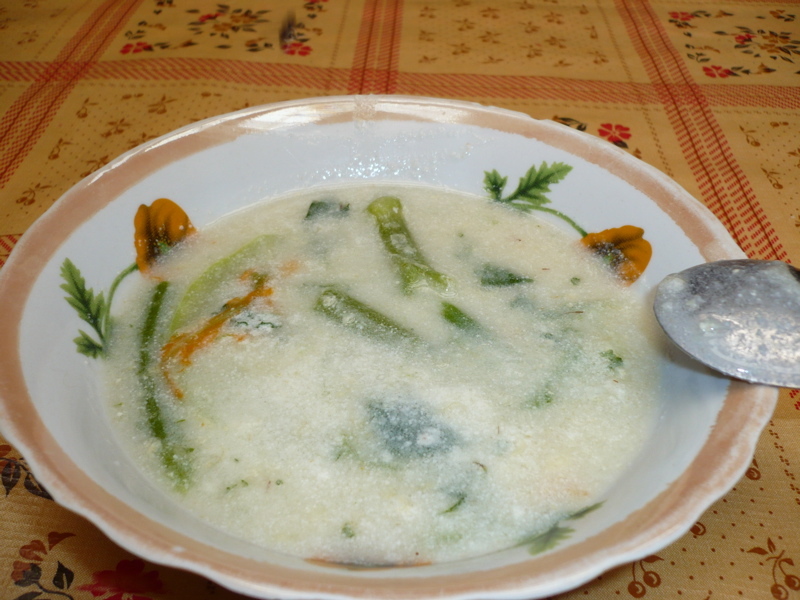 Arrive in Oaxaca on Saturday, travel to the village and settle into your B&B. 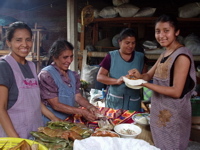 Sunday is a free day to arrange an optional guided visit to the Tlacolula market or to explore the region on your own. 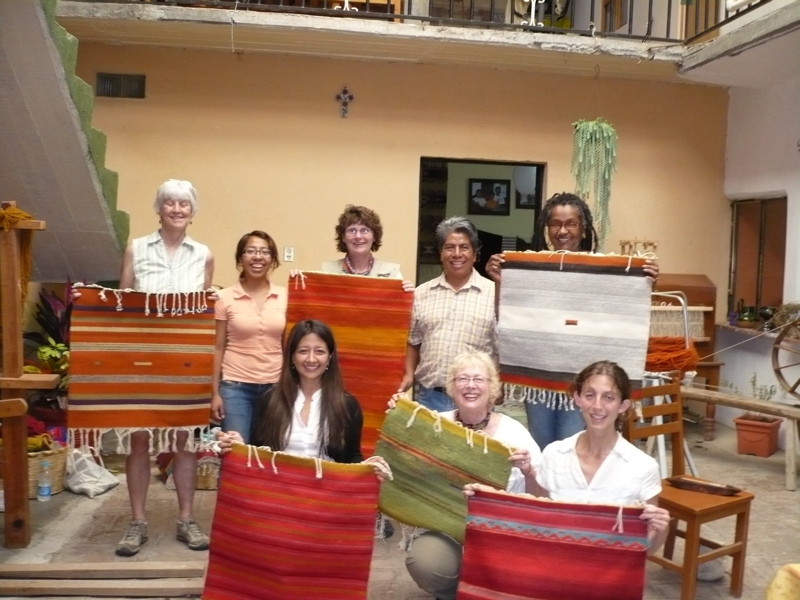 Day One, Monday: Arrive at the Chavez Family Studio for an orientation and demonstration of Zapotec weaving patterns and techniques to create squares, stripes, diagonals and circles. Choose your loom and select the colors for your tapestry. Prepare the bobbins. Begin your project. 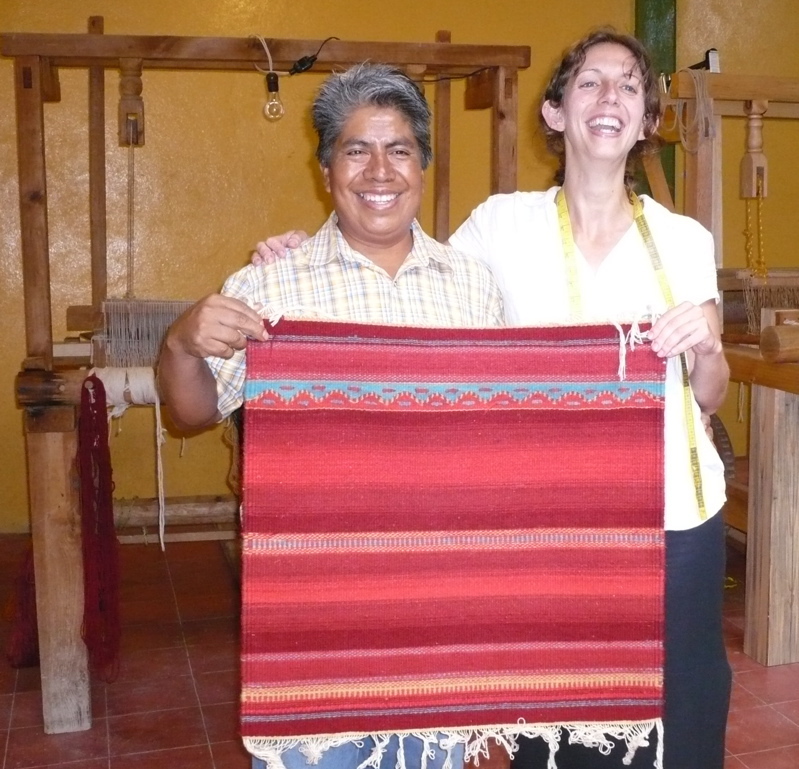 More experienced weavers will work with Federico and and his family to create more complex patterns. Days Two to Four, Tuesday-Thursday: Participate in demonstrations and then practice using the two-harness pedal loom using a variety of shuttles to make more complex patterns and greater variety of colors, experiment with using the equipment on your own, learn dyeing techniques using cochineal, indigo, wild marigold (pericone) and moss. Learn how to count threads to create a circle or square within the overall design. Finish off your piece by cutting it off the loom, rolling and tying fringes. Additional nights lodging and single supplements available. Saturday: Arrive in Oaxaca, travel by taxi (on your own) to your bed and breakfast in Teotitlan del Valle. Explore the village on your own. Optional Sunday Guided Visit to the Tlacolula Market (pre-workshop): Your guide will meet you at 10 a.m. at your bed and breakfast for the bus trip to the Tlacolula market. Transportation costs not included. Take comida (lunch) in the Tlacolula market. Additional $40 USD per person. 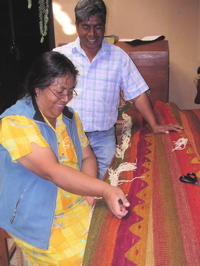 Monday-Thursday: Oaxaca Weaving Workshop: Dancing on the Loom at the home and workshop of the Federico Chavez Santiago family. Options Can Be Arranged: visits to the archeological site Mitla, additional nights of lodging, day trips to outlying crafts villages. Transportion included. Cost for the 6-Night/5-Day Program is $965 USD per person, double accommodations. Additional nights lodging can be arranged at $40 per night per person. Contact: normahawthorne@mac.com for more information and to register. How to Register: A $300 USD deposit is required to reserve your space. Final payment of the balance is due 30 days before the start day of the workshop. If the final balance is not paid within 30 days before the start day of the workshop,we reserve the right to treat the reservation as cancelled. Any registrations made within 15 days of the workshop date must be paid in full at the time of registration. up to 30 days before the workshop start date, less a $100 cancellation fee. After that, deposits are not refundable. If cancellation is necessary, you may apply the deposit to a future workshop scheduled in the same calendar year. We reserve the right to cancel or reschedule workshops, in which case you may choose a 100% refund or to apply the tuition to a future workshop. Personal checks are accepted. We can also accept payment with PayPal. Contact us for details. A walking map to the Chavez casa and contact information. A list of recommended lodging in Oaxaca, in the event you wish to extend your stay or arrive earlier. 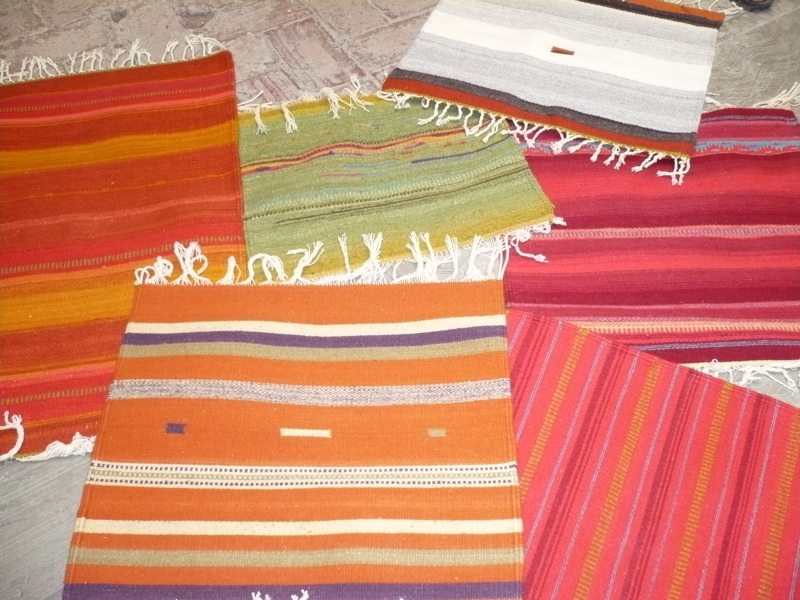 Note: Zapotec weavers use the pedal loom, which they stand at to work. People who have difficulty standing for any period of time, or who have back problems are discouraged from attending. Many of Teotitlan’s streets and alleyways are cobble stone and/or dirt, with many uneven surfaces. 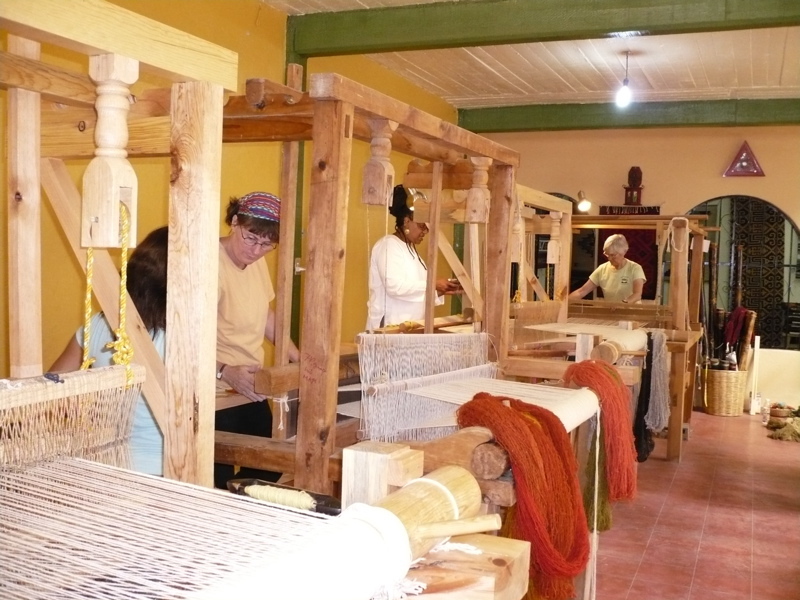 It is a several block walk between lodging options and the weaving workshop. Please bring appropriate walking shoes. Friday Market, Ocotlan with stops in San Martin Tilcajete and San Tomas Jalieza; cooking classes; temezcal bath; Spanish lessons; hiking to Mt. Picacho and the Presa; birdwatching in Benito Juarez; visit to Cochineal Farm; a day in Arrazola and Atzompa; handmade paper factory in San Augustin Etla; visits to 2,000+ year old Zapotec archeological sites: Mitla, Dainzu, Yagul. Customized day trips can be arranged before or after the workshop. Prices quoted upon request. U.S. Citizens traveling to Mexico are required to carry a current passport, valid for at least three months after your re-entry to the U.S. It is your responsibility to obtain proper documentation. If you are not a U.S. Citizen, contact the Mexican embassy, consulate or national airline of Mexico for entry requirements. Please consider purchasing travel insurance. Unforeseen circumstances of getting to Teotitlan del Valle could cost you more than you expected. In the event of an emergency or natural disaster caused beyond our control, trip insurance will cover any unexpected expenses. This entry was posted in Oaxaca Mexico art and culture, Oaxaca rug weaving and natural dyes, Teotitlan del Valle and tagged cochineal dyes, indigo dyes, learn to weave, Mexico rug patterns, natural dye workshop, tapestry weaving, Teotitlan del Valle, textiles, weaving, weaving instruction, weaving lessons. Bookmark the permalink. Is there an RV Park, or safe place to stay in our RV nearby? Your workshop sounds wonderful. Please send updates for future ones in 2010 and later. I stopped by the Chavez Santiago Family’s studio a few days ago as I was passing through Teotitlan. I was only in the area for an afternoon, so Norma she was kind enough to arrange to give me brief summary of the natural dying process with Janet Chavez Santiago. She showed me all of the fruits and natural materials which are used and was really informative on the procedure. As I was in the workshop, Janet’s mother was working away at the loom. With kind smiles, I felt welcomed and appreciated this experience intensely. I recommend it to anyone interested in traditional weaving. 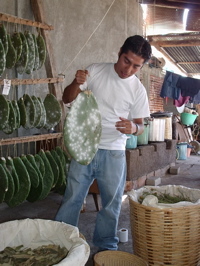 All the dates have been added to the registration form on my website: http://www.oaxacaculture.com Thanks so much for your interest. There is plenty for spouses to do, too! Hiking, bird watching, exploring archeological sites, visits to local villages, meandering the city in search of great food, visiting museums and 16th century churches, cooking classes, horse back riding, volunteering at the organic farm. I am very interested in participating. I can not imagine a more appropriate setting for learning to weave, where the color, textures and patterns of the landscape must inspire great artistry. Do people bring spouses that do not participate in classes? If so, what do they generally do with their time? Lastly, I saw the registration form does not include the Jan. 2009 dates. Will there be sign up process for those classes? I am intrested in anything natural and indigenous, and I came upon this web site by “accident”. 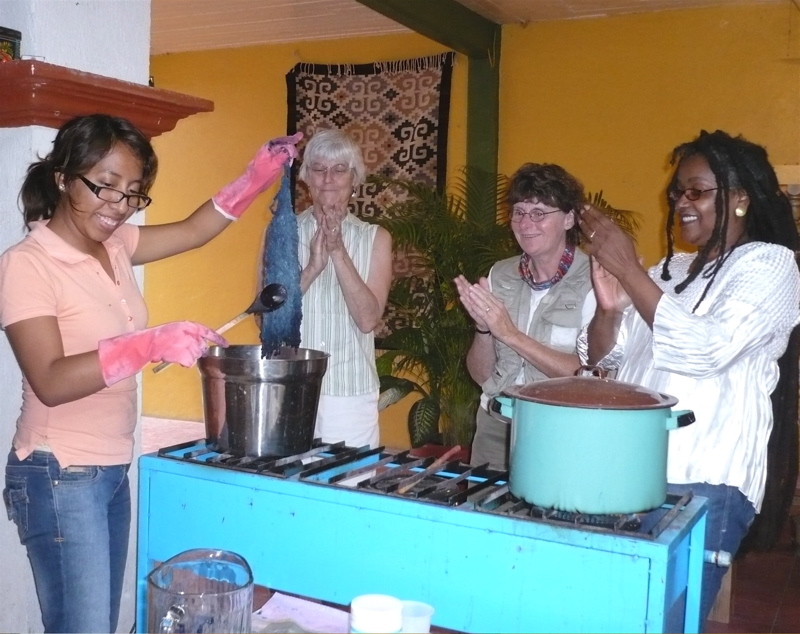 Really cool, I have taken a class in natural dying silk and another class in basket weaving, and your workshop sounds crucial! Anyway, if you have flyers or brochures I would be happy to put them up at health food shops in my area. I live in Santa Cruz, California.